Ken is widely known for an expressive and improvisational style and for creative ensemble playing. His extensive repertoire ranges from traditional music of Ireland, Quebec and Appalachia to music from over 20 countries from around the world. Ken has toured extensively throughout North America and Europe with the acoustic folk trio Helicon with Chris Norman and Robin Bullock (Maggie's Music recording artist), with Greenfire with Laura Risk and Robin Bullock as well as in solo performance. 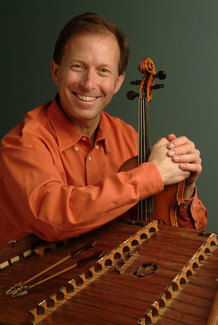 He is considered one of the most influential performers and teachers and has taught at countless festivals and music camps and is well know for both hammered dulcimer and old-time fiddle. Ken has been featured in nationally broadcast concerts on NPR, All Things Considered, German National Radio, on the CBC, and on The Voice of America. His credits include an Emmy-nominated CBS-TV Christmas special as featured soloist, a 1997 recording that hit the top of the World Music charts and was a top seller for BMG in their Classical/World Music category and with Helicon, an "Indie"award. "Ken plays with spirit and sparkle. True to the music he plays, he obviously loves what he does and so will you." "One of today's most accomplished, musical hammered dulcimer artists... A hammered dulcimer player of great taste and sophistication." 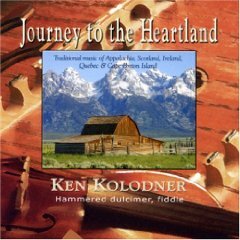 "Kolodner's skillful touch and the hammered dulcimer's shimmering tones conjure meditative and soulful moods." (only available as digital download), Read the Press Release!